On October 28, 2014, hundreds of Porgerans marched onto Barrick Gold’s Porgera mine site to demand benefits that rightfully belong to the Porgera Special Mining Lease (SML) Landowners. 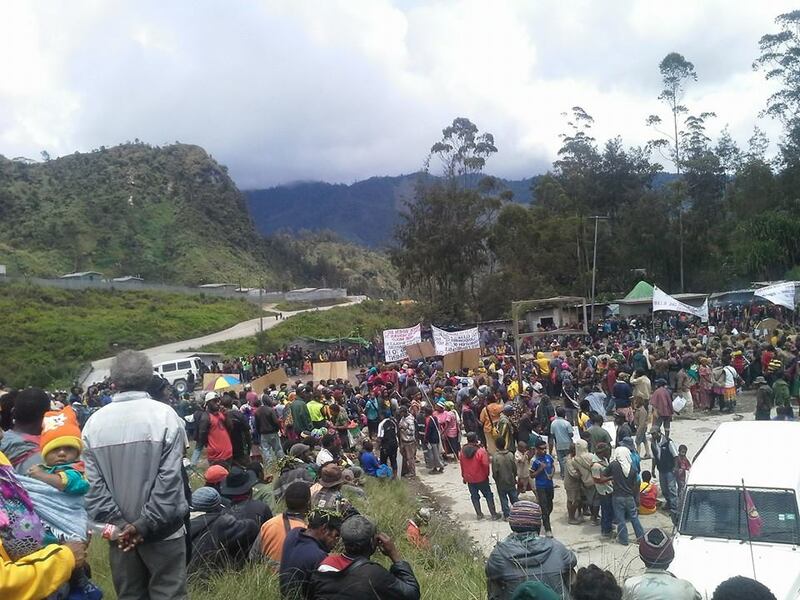 On Oct 17, Barrick Gold was given a 48 hour ultimatum to respond to requests by landowners at their controversial Porgera mine in Papua New Guinea. The first demand, that Barrick become Party to a revised Porgera Mine Memorandum of Agreement and make a date to commence MOA review, has been the landowners “number one ask from day one”, according to a letter dated October 17, 2014 from the landowners association to Barrick management. For many years, the Porgera Landowners Association has been urging Barrick Gold for the resettlement of their people away from the Porgera mine site, through MOA reviews, and an international pressure and educational campaign including an OECD complaint and several appeals to the United Nations. After the protest reached the Barrick mine, the company agreed to give an answer to the landowner’s demands by Nov. 10, 2014. In an extraordinary break from his ‘neutral’ role as Australian aid funded adviser to the ABG, Anthony Regan has launched an extensive attack on elected leaders from central Bougainville in an Australian journal, Security Challenges [see link below]. According to Regan no-one on Bougainville opposed to Rio Tinto for its past misconduct has pure motives, they are all in the pay of backdoor players! He claims Lawrence Daveona ‘the executive of the Panguna Special Mining Lease landowners association, has come under the influence of an adviser [David Martin] from the United States. They too support Panguna re-opening, but oppose BCL, mainly on the basis that the adviser claims to be able to raise the approximately US$6 billion need to re-open the mine, which would permit the Panguna landowners to own the mine lease’. Regan has also suggested that the central Bougainville MP’s concerns over environment and landowner trauma is nothing but a trick. He argues, ‘the Member of PNG Parliament for Central Bougainville, Hon. Jimmy Miringtoro, wants the Panguna mine to re-open, he favours his own candidate company to replace BCL’. Not finished, Regan also goes after the Me’ekamui Government of Unity – ‘The Me’ekamui Government of Unity, based at Panguna, also opposes the re-opening of Panguna, mainly because in the absence of large-scale mining there, the leaders have been entering, or attempting to enter, a range of agreements with foreign interests, in which they have purported to grant long-term rights over minerals in various parts of central Bougainville’. It does not stop there. According to Regan, the only ones who are pure of heart in their criticism of Rio Tinto are OUTSIDERS – but he claims, these outsiders are too stupid to realise they are being used by the backdoor players to help rob Rio Tinto of its Panguna gold. He argues, ‘From early 2013, when public discussion first emerged about ABG development of “transitional” mining legislations, a curious and perhaps to some extent unwitting “alliance” developed between the outside mining interests and their Bougainvillean partners, on the one hand, and PNG and Australian activists on the other’. He suggests, ‘none of these activists [critical of Rio Tinto] have long and deep connections to Bougainville, nor detailed understanding of the current problems and pressures facing Bougainville, they have perhaps unwittingly developed alliances with outside interests seeking to get control of mining and mining revenues for their own benefit, and contrary to the interests of Bougainville’. This narrative created by Regan which claims outsider critics of Rio Tinto are pure in motives but thick, while all Bougainvillean opponents of Rio Tinto, are on the payroll of backdoor players, is an insult to all those who fought and died fighting Rio Tinto for reasons OTHER than money. He doesnt understand land and culture are worth more than money. Will the ABG President finally come out and condemn these attacks on his constituents and colleagues? Enough is enough! The United Nations has been forced to admit that PNG’s development model – based on unrestrained capitalism and large foreign owned resource extraction – is not benefiting ordinary people – see story below. But the UN can’t grasp what really is wrong and therefore offers only the rather ridiculous conclusion that better training is what is needed to sort things out! The fact is the development model is the wrong one for PNG and it has been imposed on us by foreign powers who seek only to profit from our resources. Roy Trivedy should read up on the history of other nations who have been forced to follow the false wisdom of the World Bank, US, European Union, World Trade Organisation etc etc… and then he should study our PNG Constitution to learn about a much better development model suited to our needs NOT theirs! 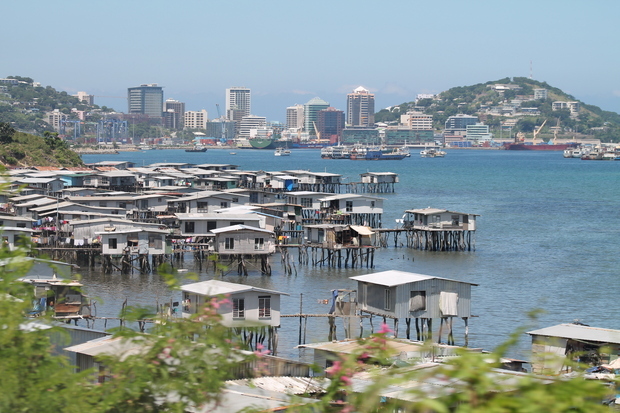 The United Nations says Papua New Guinea’s increased economic growth is not resulting in the expected rise in jobs and societal improvements. The resident coordinator for PNG, Roy Trivedy says rural areas are not seeing better human development outcomes, despite 14 years of continued economic growth. He says one problem with employment levels is that rural people especially are not trained and don’t have the skills needed for the jobs available. Roy Trivedy says NGOs and other development partners need to work closely with governments in the countries at all levels, to coordinate their efforts better. Ol papa graon klostu long OK TEDI mine long Papua New Guinea nau i wari tru nogut bai oli no nap kisim kuik Compensation moni blong ol. Oli wari long wonem oli no save husat tru bai baem K500 tausan kina igo long Bank blong redi-im ol despla moni blong ol papa graon. Siaman blong PNG Sustainable Development Program Sir Mekere Morauta ibin autim despla wari blong en na oli no gat despla kaen moni long givim igo long Bank. Emi tok stat long taem gavman blong Praim Minista Peter O’Neill ibin kisim OK TEDI mine na stopim wok blong PNGSDP, despla i kamapim planti heve long ol papa graon. Martyn Namorong emi wanpla mansave blong social media na emi kam long Western Province we Ok Tedi mine istap long en na emi tok gavman na Ok Tedi imas stretim kuik despla wari long wonem ol pipal imas kisim ol liklik moni blong ol. Emi tok tu olsem ol papa graon isave kisim despla moni blong helpim sidaon blong ol long ples, long wonem olgeta bus, na wara blong ol i bagarap pinis long ol posin pipia blong mine. The New Zealand decision under the EEZ Act teaches a number of lessons for other Pacific Island countries that have growing interests in deep seabed mining as a means of economic development. Papua New Guinea (PNG), for instance, has garnered attention for issuing a commercial deep seabed mining license to a Canadian company Nautilus Minerals. Nautilus is supposed to begin the world’s first seabed mining operation on the PNG continental shelf in 2016 and, if successful, will prove the technical and economic viability of seabed mining. Other Pacific Island developing countries are in the process of designing legal regimes to provide a favourable environment for foreign investment and satisfy those environmentally concerned. The concern is that these early movers are operating on a set of untested assumptions, namely that seabed mining will raise a significant amount of revenue to stimulate national economic development while preventing serious harm to the marine environment. 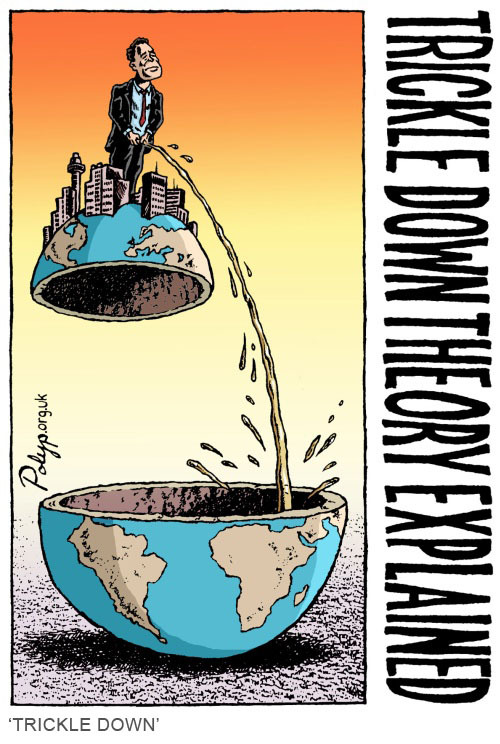 As illustrated in the Trans-Tasman Decision, however, there may be too many uncertainties at this stage with respect to effects on the environment as well as the economy. In the face of such uncertainties, international law dictates that states apply the precautionary approach in decision-making. Abstract: This short piece analyses a recent path-breaking decision by the Decision-making Committee (DMC) of the Environmental Protection Authority (EPA) of New Zealand. In Trans-Tasman Resources Ltd Marine Consent Decision (June 2014), the DMC considered New Zealand’s first application for ‘marine consent’ for continental shelf seabed mining under the Exclusive Economic Zone and Continental Shelf (Environmental Effects) Act 2012 (EEZ Act). Evidence submitted so far to the EPA’s hearing on a deep sea phosphate mining proposal for the Chatham Rise shows the proposal should be rejected for a number of very concerning reasons, environmental groups said today. Chatham Rock Phosphate wants to mine phosphate off the seabed, 450m deep on the Chatham Rise, off the east coast of New Zealand’s South Island. Greenpeace, Kiwis Against Seabed Mining and the Deep Sea Conservation Coalition have combined their representation at the meeting and today gave their submission at the hearings in Hamilton. The activity would negatively impact both the mining area, and the site around it, destroying the benthic environment of the mined area and far beyond. “The evidence shows that there is no realistic possibility that the area can be remediated,” lawyer Ruby Haazen, representing the three groups, told the hearing today in their summary of evidence. “Chatham Rock’s proposal will destroy or put at risk significant biodiversity,” she said. Evidence that had been presented throughout the hearing showed a lack of baseline information about the creatures and corals that lived at that depth. No marine mammal survey had been carried out, and there were significant gaps in the evidence on noise, which could cause temporary or permanent threshold shift (hearing loss) in marine mammals 3 km away. The phosphates have high levels of uranium, which has raised many questions about the effects of uranium on marine species. She also noted that Chatham Rock Phosphate had not yet even confirmed which company would undertake the mining. International mining company, Boskalis, had presented evidence for the company, but the groups had a number of concerns about the company, such as the fact that it had been involved in numerous environmental breaches – some alleged, some proven. If Boskalis were to go ahead with the mining, this would raise a number of legal issues in the face of any environmental problems. It flew a “flag of convenience,” which are commonly used to avoid stringent regulation. “It is completely unclear who will have responsibility if something goes wrong. The EPA may face a game of passing the buck between Chatham Rock Phosphate and Boskalis,” Haazen told the hearing. 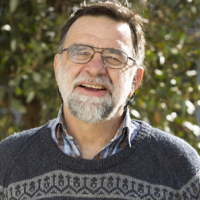 Kiwis Against Seabed Mining Chairperson, Phil McCabe, told the hearing that the application was a “world first” in terms of seabed mining at such depth. Yet little was known about the impact, and Chatham Rock Phosphate had not done enough research. The company had cut corners and there was still not enough information to provide evidence-based understanding of the impacts.